Germantown Mennonite Church from 1905 postcard. 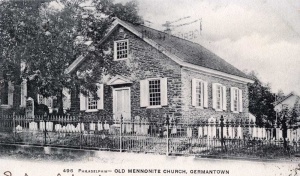 The Germantown Mennonite Church, the first Mennonite congregation in America, observed its first baptism and communion service in 1708, but congregational life began at least as early as 1690. In that year a visiting Reformed minister from Holland, Rudolphus Varick, found the Mennonites there worshiping every Sunday, with "Menist" Dirck Keyser of Amsterdam reading a sermon from a book by Jobst Harmensen. For a time the Mennonite settlers here, who first came in 1683, had worshiped with the German Quakers, who in the early years constituted the majority of the Germantown settlement. In 1690 (or 1698; the manuscripts differ), Willem Rittenhouse (d. 1708) was chosen as first preacher and Jan Neuss as deacon. In 1702 a second election was held, when Jacob Gottschalk and Hans Neuss were chosen preachers. In early 1708 the newly arrived (1707) Palatine Mennonite families united with the Dutch-speaking church, as a result of which three deacons (Isaac van Sintern, Heinrich Cassel, and Conrad Jansen) and two preachers (Härmen Karsdorp and Martin Kolb) were chosen from the newer immigrants. About the same time, when the membership was 34 (in 1712 it was 99), eleven new members were baptized by Jacob Gottschalk, who thus began serving as the first Mennonite bishop in America. Gottschalk's brief sketch of the early history of the congregation to 1712 (preserved in Michael Ziegler's historical letter of 1773 to Holland; see Wenger, 395) is the only extant source for the early years. In 1708 also the first log meetinghouse was built on land donated by Arnold van Vossen in 1703. In 1770 this building was replaced by a stone building, which is the oldest Mennonite meetinghouse in America, in use until the early 1990s. At that time the membership was 25, but in 1789 it had grown again to 46. By 1798 the monthly services were being conducted by visiting ministers from the Franconia district churches. By 1839 the congregation was "facing dissolution," but it survived and in 1863 was reorganized as a member of the Eastern District Conference (General Conference Mennonite). In the early 19th century apparently the relations to the Franconia Conference (Mennonite Church) had become so tenuous that the congregation was in effect an independent congregation. During the early 1800s the old Germantown congregation gradually declined. In the division of 1847 in the Franconia Conference the remaining handful of members sided with the new Eastern District Conference led by John H. Oberholtzer and Abraham Hunsicker. In 1851, when the Hunsicker group broke with the new conference, the congregation stayed with Hunsicker. During the next years the preachers were Abraham Hunsicker, Henry Hunsicker, F. R. S. Hunsicker, and Israel Beidler. In 1863 the congregation was formally reorganized with 13 members. Finally in 1876, after the death of Beidler, the congregation returned to the Eastern District Conference and continued weekly worship throughout the years since then. Ministers from 1876 to the 1950s were John A. Haldeman, N. B. Grubb, W. MacArthur, H. Frederick, A. Funk, S. M. Grubb, S. Musselman, F. Gabel, J. Bayley, A. S. Shelly, H. Landes, W. Wolfe, and R. Brewer. In 1970 the trust reorganized to include delegates from the General Conference Mennonites, Mennonite Church, Eastern District Conference, Franconia Conference and the local Germantown Mennonite Congregation. In the 1970s the affiliation with the Franconia Mennonite Conference was reinstated, and Germantown became an early "dual-conference" Mennonite congregation with membership in the General Conference Mennonite Church and the Mennonite Church. In 1987 the congregation began renting space from neighboring facilities and in 1993 purchased a building at 21 West Washington Lane. Bender, Harold S. "The Founding of the Mennonite Church in America at Germantown 1683-1708." Mennonite Quarterly Review 7 (1933) 227-250. Bender, Harold S. "Was William Rittenhouse the First Mennonite Bishop in America?" Mennonite Quarterly Review 7 (1933): 42-47. Cassel, Daniel Kolb. History of the Mennonites: historically and biographically arranged from the time of the Reformation, more particularly from the time of their emigration to America, containing sketches of the oldest meeting houses and prominent ministers ; also their confession of faith, adopted at Dortrecht, in 1621. Philadelphia: Daniel K. Cassel, 1888. Grubb, N. B. The Mennonite Church of Germantown. Philadelphia, PA, 1906. Wenger, John Christian. History of the Mennonite: of the Franconia Conference. Telford, PA, 1937. See chapter I (Part II, Congregational Histories) "Germantown," 87-95. Bender, Harold S., J. Herbert Fretz and Sam Steiner. "Germantown Mennonite Church (Philadelphia, Pennsylvania, USA)." Global Anabaptist Mennonite Encyclopedia Online. 2007. Web. 22 Apr 2019. http://gameo.org/index.php?title=Germantown_Mennonite_Church_(Philadelphia,_Pennsylvania,_USA)&oldid=130725. Bender, Harold S., J. Herbert Fretz and Sam Steiner. (2007). 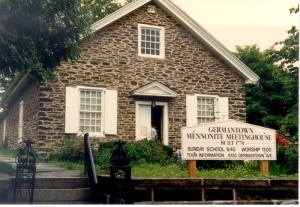 Germantown Mennonite Church (Philadelphia, Pennsylvania, USA). Global Anabaptist Mennonite Encyclopedia Online. Retrieved 22 April 2019, from http://gameo.org/index.php?title=Germantown_Mennonite_Church_(Philadelphia,_Pennsylvania,_USA)&oldid=130725. Adapted by permission of Herald Press, Harrisonburg, Virginia, from Mennonite Encyclopedia, Vol. 2, pp. 481-482. All rights reserved. This page was last modified on 16 February 2015, at 22:33.